This pavilion-like structure, that houses an extension to the existing kitchen in an 18th century house, is designed like an over-scale porch. It is made of aluminium and glass, contemporary materials and construction technology, that do not conflict with the stone walls of the existing house but, rather, create a light and airy screen to the back of the house. In order to accentuate the ephemeral qualities of this addition in the garden, the shading device that was built to protect the south-east façade of the extension was designed as a screen that is operable to allow maximum vision of the garden during periods of inclement weather, and maximum shade during the hot season. The screen belongs as much to the garden as to the kitchen. In view of this, it was decided to create a vegetal surface, made from hemp and flax, which has a strong tradition in the long history of rope-making for sea vessels. This material withstands harsh external environmental conditions; it is environmentally friendly, visually rich and engages the senses of touch and smell. The forms that have been created by French artist Aude Franjou also play on the natural qualities of the material. 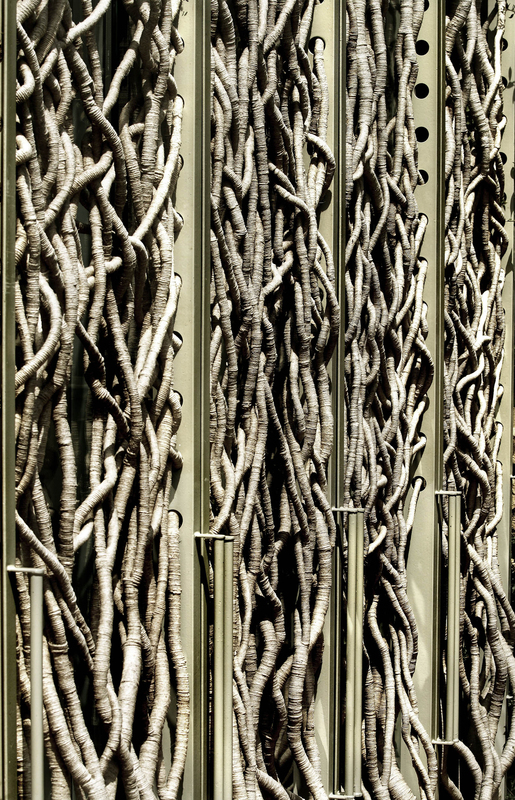 The technique adopted for the sculpture is a variation of a tapestry weaving tradition and involves twisting a flax strand around a heart of hemp, the desired curvature of the branch being derived from the tension applied by hand during the process. It is then woven onto a folding steel frame. 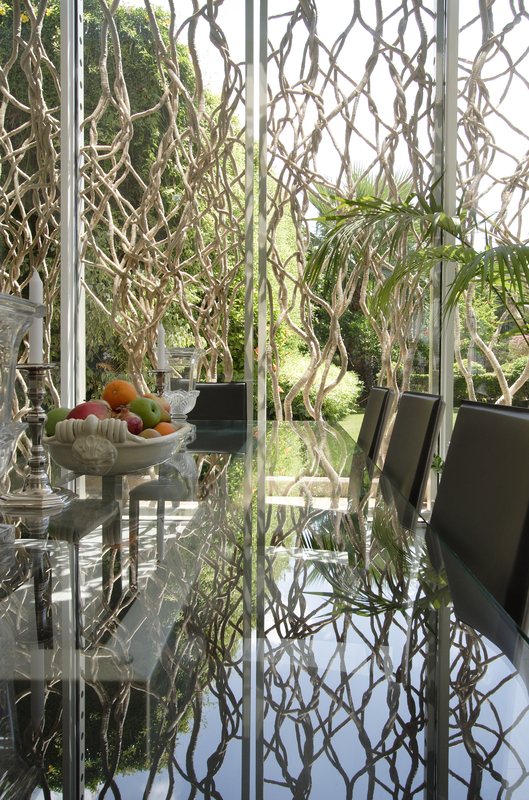 Like trees growing out of the ground and spreading their tentacle-like branches over the glass surfaces of the kitchen walls, this contemporary sculpture creates a dialogue between the garden and the kitchen, belonging as it does to both the mineral and the vegetal world.